At the beginning of this month, Congress was finally able to hammer out a compromise to the debt resolution standoff that had split the two political parties quite divisively over the last several months. The agreement is far from a perfect solution and is already drawing criticism from both sides but it does prevent the United States from defaulting on its sovereign debt for at least the near term. What’s less clear is exactly where this $2.5 trillion deficit reduction (this number comes from President Obama himself) will come from. One can assume that areas like defense spending will be cut but there’s probably a high likelihood that we’ll see programs like Medicare and Social Security affected as well. Social Security benefits for current retirees will probably remain but future retirees could very well see a very different program soon. 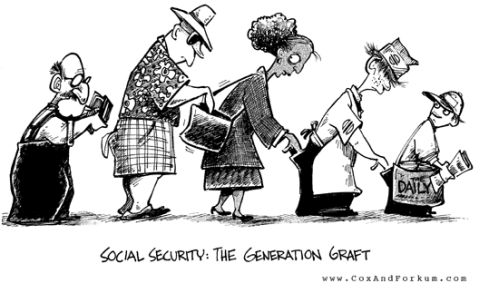 Cuts to Social Security could come in many different forms. One of the more likely possibilities is raising the retirement age. Right now, a retiree can apply for full retirement benefits at the age of 67 but they can also apply for a reduced early benefit as early as age 62. Under an amended program, there has been talk of moving the retirement age to 70 years old and the early retirement age to either 64 or 65. This move would not only help shore up a system that’s in need of an overhaul to simply stay afloat but also help lessen the burden on the federal debt. Another option is to raise the amount of income that can be taxed. Right now, Social Security taxes are levied on income up to $106,800. Raising this ceiling increases the amount of money that will go into the coffers thus extending the life of the Social Security program but also giving the government a much needed additional revenue source. In short, if you’re a high earner, expect to be shouldering a good chunk of the load. And while the government may be increasing Social Security taxes they may very well be decreasing benefits to go along with it. It goes without question that Social Security benefits is a significant financial outlay for the government and finding a way to reduce that outlay (or conversely increase the return that money already in the system can earn) might become a higher priority in the next debt resolution proposal. The annual cost of living adjustment could be another feature that is affected. This made news in the recent past as the Social Security Administration announced that they were making no cost of living increase to monthly payments. The monthly adjustment is currently being tied to the inflationary price increases but it could end up being linked to a broader consumer price index which would be expected to rise at a slower rate than the current scale. The Social Security system can’t exist in its current form for the long term but it’s not necessarily just because of the solvency of the system. Changes made to the system now will have implications on how the current debt standoff comes to a resolution. And in just about any scenario, it’s the taxpayer that’s going to end up footing the bill. I really think they should get rid of the cap. I honestly don’t understand why there is a cap to begin with. I think that would help immensely.